what people are saying about The Angel . . . The author states that some of the inspiration for this book came from a statue of an angel by David Altmejd called 'the eye.' According to Rebecca, it is one long poem, 32 pages of verse, along with photographs of the statue, 'the eye.' Her poetry is not about revolution, politics, philosophy or science, football or any sports, or religion, with no profound message. What I like about the book is the simplicity of the format anywhere from four lines to fourteen lines on every page, sometimes like Haiku and at other times like the free verse of Richard Brautigan and Beat Poets. There is some interesting imagery such as "Somewhere on rain street, the hanging tree, like selling indulgences" As is the case with many writers there are the influences of modern day media, some reference to Leonard Cohen. Some lines that seem to come right out of a Batman and Robin movie, "that golden wings could mend." Another thing I liked about the book was the consistency with the theme around the statue of the angel. After many years of writing there is still a freshness to the work as almost seen through the eyes of a child. Some people are good at turning real life into stone and metals and others write about metal and stone like it was made of flesh and blood. Some times there are angels everywhere when you look around as we go through a war torn world each day. This is a good read. 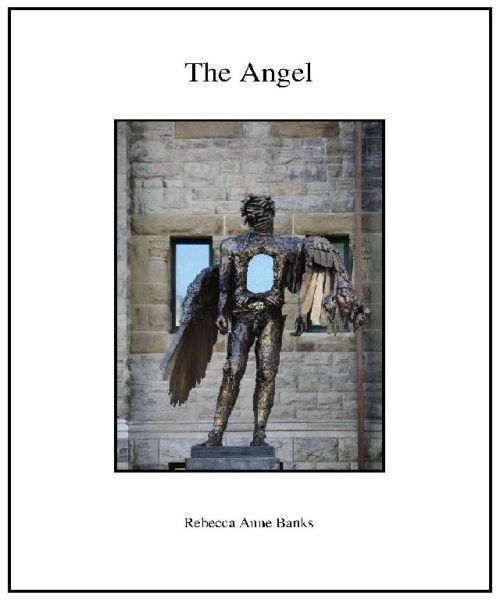 The Angel, by Rebecca Banks, is a book length lyrical poem entwined with photographic images of The Eye, a sculpture by David Altmejd, commissioned by the Montreal Museum of Fine Arts. This sculpture is part Michelangelo’s David, part fallen angel. Imagine the statue of a man, the left arm mechanical, the head a tangle of hands, two wings (neither apparently in working condition) and torso a blank rectangular hole. In the cover image, this hole is filled with the color of muted blue sky. The dozen images scattered throughout the book are from various angles, suggesting a different view of the angel, according to the position of the lens. In its approach, the book is reminiscent of “13 Ways of Looking at a Blackbird,” by Wallace Stevens. The beginning of the poem presents the Angel as messenger, The Angel as gateway to divine wisdom: “The Spirit / whispers to the Angel / the secrets of the world / if you listen closely / he will whisper them to you.” The poem then erupts into invocation: “Angel of harkness . . . o’ well loved angel . . . . fly us anywhere, / somewhere / even here, / heaven is blue.” The color blue occurs throughout the poem: “angel bluesky”; “in the sky / the quiet of blue”; “blue o’ sweet blue”; “somewhere blue / you dance with the sky”; “I could imagine blue”; “to drink the blue”; “blue sky cathedral”; “blue / as the sky.” Understandably, the sky is a recurring image, as are windows. This is not your typical angel, for this angel conveys “secrets of the world,” and the invocation is to “fly us anywhere . . . even here.” This is some “street angel” who “sits, so beautiful by the road.” “Some angel on his knees.” This angel has feet, as well, and walks. This is the angel “by the battlefield.” The angel, who, perhaps, needs a sense of redemption himself. I’m not exactly sure whether the angel is truly the messenger of God, or a messenger in search of redemption himself; and, this is what makes this book length lyric so interesting. The poem ends: “The long road / and the conversation / of a lover, / going home.” I like to think, at the end of the poem, that this angel is made whole, that the rectangular hole in the center of his chest is filled in (even with blue sky) and that he is no longer on his knees, in the street, a “beggar,” fashioned” from “the gut strings” of a “guitar.” I like to think that it is the poet who has become angel. In addition to recurring images, repetition and assonance also occur in the poem. Sound effects seem not contrived, but natural. This is poetry that is not striving to be poetry. It simply is. Overall, a stunning book of image and text. and more poetry from The Angel . . .
he will whisper them to you.